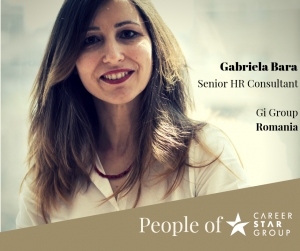 Gabriela is the Senior HR Consultant for Gi Group Romania. She is skilled in creating outplacement programs, training and evaluation, assessments, career coaching, vocational counseling, and career counseling projects. Gabriela has 16 years of experience in human resources and psychology, guiding clients through professional analysis and assessment of skills, knowledge, competencies, personality traits, preferences, goals, values and motivations. She has helped professionals determine the main directions of their development and their preferred positions. She has created and presented on the most effective methods to find new jobs, and has counseled clients to become aware of and process emotions associated with change, looking at the future with an open state of mind. Learn more about Gi Group Romania!